For more information and contact details please download the detailed specification . It is anticipated that interested parties will be invited to tender during late summer / early autumn 2018. 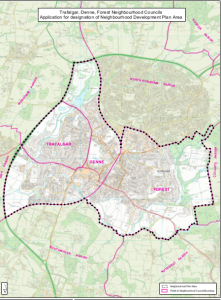 The Horsham Neighbourhood Councils of Trafalgar, Denne and Forest were instrumental in the creation of Horsham Blueprint which was formally established in June 2014 with the designated area being approved by Horsham District Council on 5th June 2015. The forum area is coterminous with the Neighbourhood Council boundaries. The forum area is primarily residential with around 26,000 residents but does include the town centre commercial / retail areas together with a number of industrial estates. retain all that is best of its character whilst being an all age friendly town that encourages enterprise.